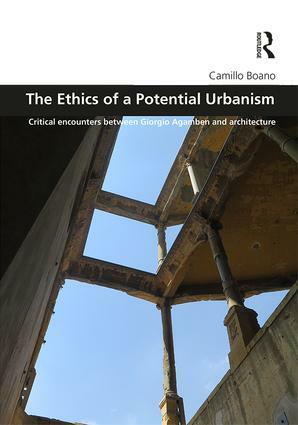 The Ethics of a Potential Urbanism explores the possible and potential relevance of Giorgio Agamben’s political thoughts and writings for the theory and the practice of architecture and urban design. It sketches out the potentiality of Agamben’s politics, which can affect change in current architectural and design discourses. The book investigates the possibility of an inoperative architecture, as an ethical shift for a different practice, just a little bit different, but able to deactivate the sociospatial dispositive and mobilize a new theory and a new project for the urban now to come. This particular reading from Agamben’s oeuvre suggests a destituent mode of both thinking and practicing of architecture and urbanism that could possibly redeem them from their social emptiness, cultural irrelevance, economic reductionism and proto-avant-garde extravagance, contributing to a renewed critical ‘encounter’ with architecture’s aesthetic-political function. This book offers more than an original contribution to the field; it opens a true debate that can no longer be ignored. This book examines the relevance of Giorgio Agamben’s political writings for architecture and urban design and carefully guides the reader through Agamben’s fascinating ethical and political vocabulary. The book rethinks notions such as use, productivity, and creation that are, in the design disciplines, often taken for granted. It recognises, perhaps provocatively but convincingly so, in ‘inoperative architecture’ a genuine route towards a political and ethical design practice. This book offers a timely contribution to the debates on the social responsibility of architectural and urban design, and a must-read for scholars interested in the emancipatory and transformative agency of design. For all those of us concerned with a truly alternative project for architecture, Boano's work is not only enlightening but also timely. His reading of Agamben from an architectural point of view certainly goes beyond proposing the paradox of making philosophy operative by rendering architecture inoperative: it also sheds light on a possible way out of the anti-intellectual trend that pervades contemporary architecture. Instead of a new style or another slogan to feed the industry of architecture, Boano's proposal looks for a renewed ethics which, precisely in a discipline that forgot about this word, will surely open up unexpected and yet amazing new avenues for architectural debate. Francisco Díaz, Professor at the School of Architecture Universidad Católica de Chile and Editor in Chief of ARQ Magazine, Santiago, Chile. The Ethics of a Potential Urbanism is a fascinating attempt to invigorate politically engaged architectural discourse - both as a theory and as a practice. The aim of the book is to use Giorgio Agamben philosophical project focused on an idea of radically emancipatory 'being inoperative' as a project of a new (post-capitalist?) architecture. In a context of architecture and urbanism this perspective opens possibility of a (absolute?) freedom, allowing to reject hyper-pragmatic language of capitalism (but also dated state socialist model - based on Fordist model of production). The book is a promise of new model of community and relationships between language, rules and life. How can architecture deactivate its preoccupations with "the arrogant ego of creative power" and be of use for an urban life without a final destination? This is the question addressed in this most erudite and inventive mobilization of Agamben’s work. Boano takes a major step in rendering inoperative the prevailing suppositions and practices that keep urbanism from being something else, now. Giorgio Agamben’s political thought has inspired architecture and planning theory over the last decade. Camillo Boano’s new book is a significant contribution to this debate, and a landmark in the growing literature that focuses on the relationships between architecture, urban design and planning and political philosophy. This original book takes the debate to a new level of erudition while also framing Agamben’s politics in relation to the material space and the contemporary landscape. This book is indeed ground-breaking work that provides an important source for scholars concerned with the encounters between spatial practices and Agamben’s politics. Camillo Boano is an architect and urbanist. He is Senior Lecturer at The Bartlett Development Planning Unit, University College of London (UCL), where he directs the MSc in Building and Urban Design in Development. He is also co-director of the UCL Urban Laboratory.